John joined Whitelaw Twining in 2012 as litigation counsel and the Chair of our Commercial Litigation group. As a Director of the firm, he now also leads our Bankruptcy & Insolvency and Surety teams. 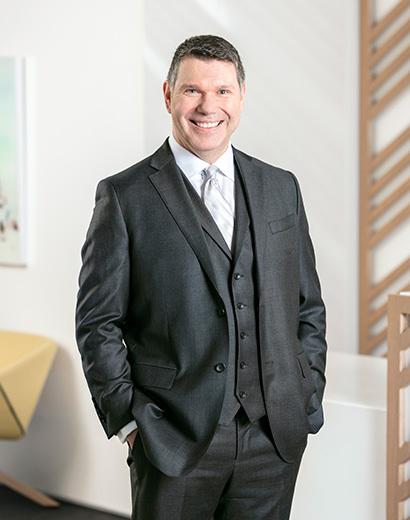 John represents a league of clients in a broad range of business litigation matters including leasing and commercial disputes, commercial and and property insolvency disputes, bankruptcy claims, breach of contract and shareholder rights. John is relentless when it comes to getting positive results for his clients—and he is dedicated to helping people solve problems. Having played hockey for as long as he can remember, competition and perseverance have become guiding principles in his legal career. John has appeared at all levels of court in British Columbia and is particularly skilled at commercial arbitrations and mediations. He values his supporting team and takes every opportunity to mentor new lawyers and paralegals in the firm. John writes extensively in his areas of expertise and is the co-author of the Annotated British Columbia Court Order Enforcement Act, published by Canada Law Book and Western Legal Publications. He has also written two chapters for the Annotated Guide to Creditors Remedies published by CLE. In addition, John authored and now updates a chapter used by the Law Society in its Professional Legal Training Course.